To the dismay of netizens across the world, last week Facebook announced plans to start autoplaying audio on videos as you scroll through your timeline. But fret no more as there’s an app that can block all the impendent cacophony – on Facebook and everywhere else. Available for Chrome and Opera, ‘Disable HTML5 Autoplay’ is a nifty browser extension that lets you block automatic audio and video before it has even started playing. In addition to Chrome and Opera, creator Eloston says the plugin is slated to also land on Firefox in the near future. What’s particularly nifty about the extension is that it works on Facebook as well as any other website that runs videos automatically. Anytime Disable HTML5 Autoplay prevents a video from playing, it indicates this in the upper right corner of your browser, where the rest of your extensions reside. For those who want to enable audio and video autoplay on certain pages or websites, the extension comes with a handy ‘Mode Rules List’ that lets you do just that. While it isn’t as straightforward as using a standard ‘whitelist’ option, it does provide an equivalent functionality. Here are some instructions on how to use it. 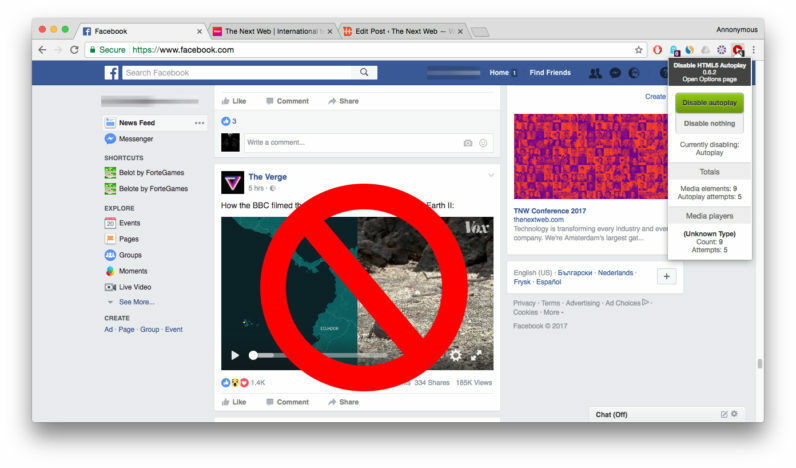 While the extension has been around since last year, the recent introduction of autoplay video with sound in Facebook and a heap of other websites has made it ever more relevant. In case you’re curious to have a look at the code for Disable HTML5 Autoplay, Eloston has open-sourced the extension on GitHub. Head to this repository for more details. Stop the autoplay madness and get the extension from the Chrome Web Store here.